The Foster's 'Race to Rio' has officially begun! In 2016, Rio de Janeiro will host the Olympic and Paralympic Games. The distance from the Olympic Stadium in London to the Maracanã Stadium in Rio (where the Opening Ceremony will be held) is… 9,298km! 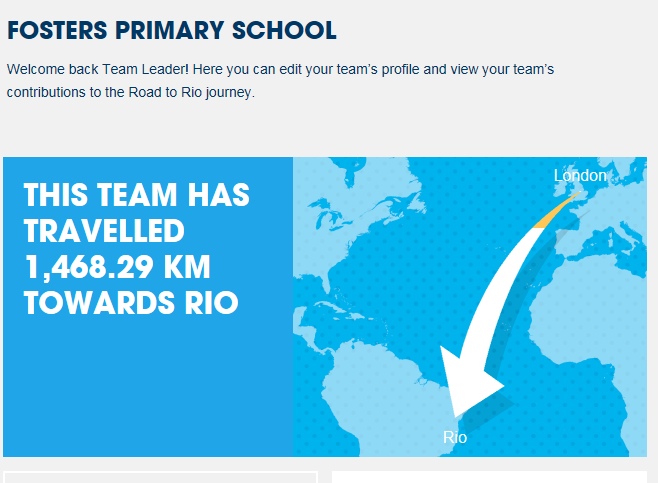 Foster's challenge is to ‘travel’ the distance from the Olympic Stadium in London to the Maracanã Stadium in Rio. Every class across the school are going to be completing their Foster's Golden Miles and these will be counted up by our Sports Leaders to give an overall total. This is just the start of our celebrations for the Olympic Games. Keep checking back for the latest news! Our progress on the Race to Rio so far. We now need a big push to get us to Rio during our Sports Week, which is the week beginning 27th June 2016.